Rebecca has always been inspired by fantastic and imaginative stories with dark themes. 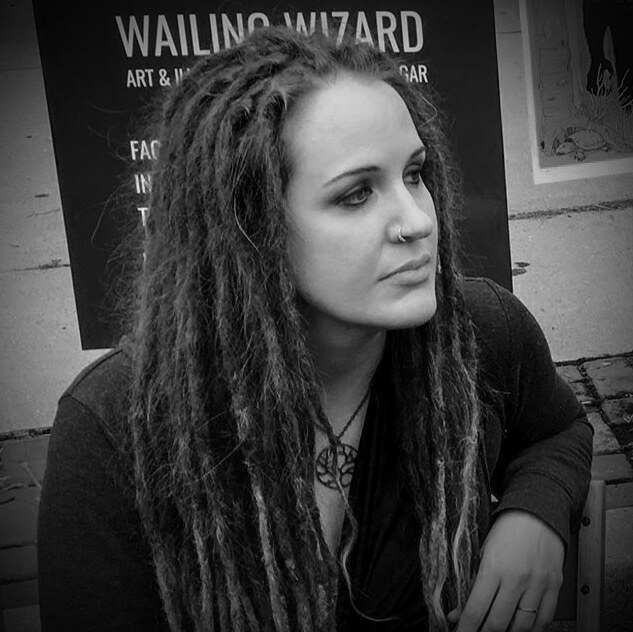 In addition to her love of fantasy art, she is actively involved in the underground metal scene as both a visual artist and musician. She has dedicated most of her artistic efforts to illustrating album covers, posters and promotional materials for bands. Her work has also appeared on book covers and on wall graphics for Spirit Halloween stores. Rebecca Magar was born in 1985 in York, Pennsylvania. As a homeschooled child growing up on a rural farm, she had substantial free time to dedicate to her passion for drawing and painting. Though never formally trained in fine arts, Rebecca is employed professionally in the creative field as a graphic designer and web developer. Her understanding of design software and production techniques along with her lifelong affection for fantasy and macabre themes influences her current illustrative work.